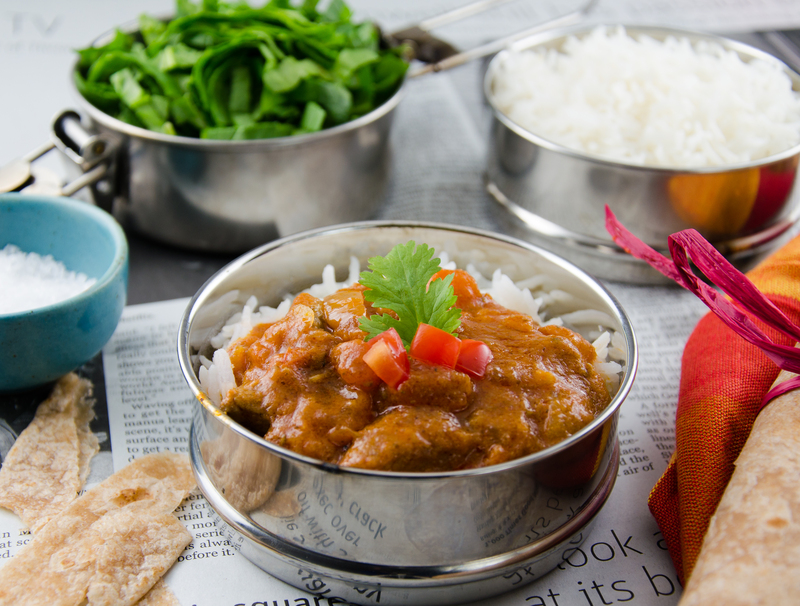 We all have our favourite cuisines, and one of mine is Indian food – I adore it! There is an amazing Indian restaurant in our neighbourhood that has been there for years; a testament to its excellent food. My husband and I eat there frequently or just grab some take-out on the way home from work, if we are pressed for time. One of my favourite dishes there, is Butter Chicken. It is so luxurious – the epitome of comfort food. Just one mouth-full of this rich concoction transports me to the exotic sights and sounds of India. Even the first whiff of it makes me forget my damp, rain-soaked surroundings. I could eat this dish all year round…except that I would have to buy much bigger pants! I mean the traditional recipe is full of…well, butter of course – and cream to boot! So, today’s recipe was the most exciting discovery! I first found it in my favourite Canadian series of cookbooks. The recipe is adapted from the 4th in the series: Whitewater Cooks with Passion, by Shelley Adams. This is Butter Chicken without any butter or cream! How brilliant can that be? For any of you who can’t consume lactose, this recipe is a revelation. I have made it twice now and both times have marvelled over the flavour and complexity and the very fact that I could go back for seconds and not feel too guilty. I have used Thai green curry paste both times that I have made it, knowing that the flavour would be a bit unusual, but it just works so well. I encourage you to try this, but I do intend to try some Indian curry paste the next time that I make it. Am I bringing this to Fiesta Friday? You bet! I know the whole gang there will go crazy for this creation. If you haven’t joined us yet for the best virtual blog party in town, come on over to Angie’s blog, The Novice Gardener. You won’t want to go home! Problems with lactose? No worries here! Mix together garam masala, coriander, harissa, salt and oil. Rub all over the chicken and marinate for at least 4 hours in the fridge. Bake the chicken in a 350°F. oven for about 30 – 40 minutes. Remove from oven and slice or shred thinly. Sauté onion, in oil until it becomes soft and almost caramelized. Add 1 tablespoon garlic, 2 teaspoons ginger, coriander, salt and tomato paste. Continue cooking over low heat for 5 minutes. Add coconut milk, and curry paste and let simmer for 30 minutes. Add tomatoes, garlic, ginger and cooked chicken and simmer uncovered for another 5 minutes to allow the flavours to marry. Serve with basmati rice, raita and hot buttered naan or chapatis. A side of green vegetables or fresh chopped spinach will make this a complete and very satisfying meal. Serve with warm chapatis and Basmati rice. Enjoy! This looks absolutely fabulous. I can imagine how wonderful your home must have smelled with this cooking, Juliana! 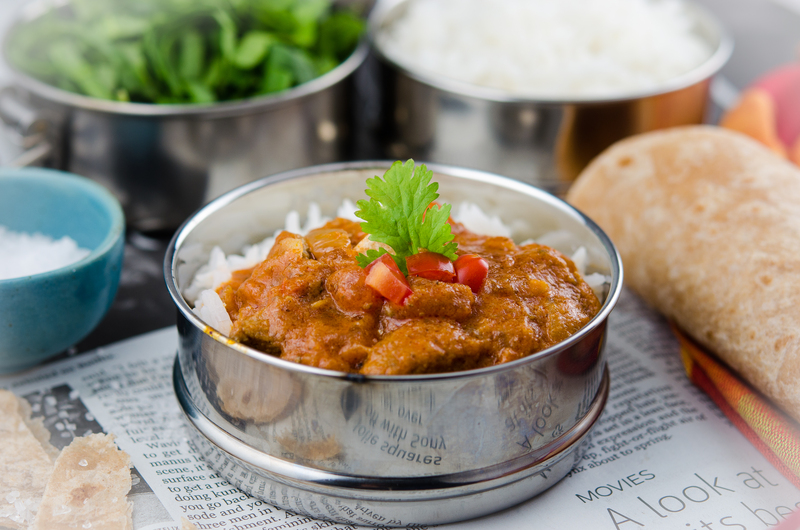 I love Indian food too, and this dish, your presentation is absolutely fabulous. Yum! Great minds think alike – I too have presented a chicken curry for today’s FF’s gathering. 🙂 I love butter chicken too, but imagine all those extra calories? I like the way you tweaked it to suit your palate, and I absolutely adore those containers you’ve served them in. Did you buy those in an Indian store? Yes, they are called tiffin carriers I believe. There’s a great movie that came out recently talking about how lucrative this particular business is. Cyclists take these tiffins to the businesses on their bicycles around lunch time, it’s a hoot to see how many they have balancing on their cycles at one time. The movie was pretty popular, I think it might be called “The lunch box”. Butter chicken is a favourite at our house too. I will bookmark this for the next time I make it. Thanks. Thanks, Hilda! I think you will really like this one! Amazing. I love butter chicken too. With this recipe you can eat without feeling even a bit of guilt. Good one. Hey Sadia! Yes, that is a really a wonderful reason to make this recipe! You are so right Julianna – I am going crazy over this dish and I am sure everyone else will too 🙂 Butter chicken without butter! It would be amazing with veggies too, Elaine! What a beautiful recipe! I can almost smell it – I love Indian food anyway, so this one’s a real revelation! This is just a genius recipe, Julianna. Rich without being full of fat – absolutely brilliant – I am bookmarking this one! And those mini tiffin containers are just adorable! Thanks for bringing this to the party – Happy Fiesta Friday! My pleasure to bring this to FF, Selma! I just love those mini tiffin tins too! One of my colleagues lent them to me! They are perfect for my size of lunch! Got to get some for myself too! I can smell it from here. Yum. Nom-Nom-Nom! 🙂 I adore butter chicken, but don’t eat it too often cause it’s well… not the healthiest dish. This recipe however, amazing, need it in my life stat. Wow, I love that you used harissa paste in the rub, it is truly a magical ingredient. I actually add it to my burgers and it makes them soooo much better. Do you think this recipe should include a dollop of butter on top? Haha! Thank you for bringing this warming and homey delicious stew like creation of deliciousness to our party this week! Aww, you are so kind, Sue! I am going to add harissa to my burgers for sure! And hey, butter on top of the butter-less chicken – blasphemous yes, but heavenly…I’m going to try that too! This recipe is delicious to look at and I love all the flavors you’ve combined without all the butter! Oh wow. I love butter chicken, but of course, my waistline doesn’t! 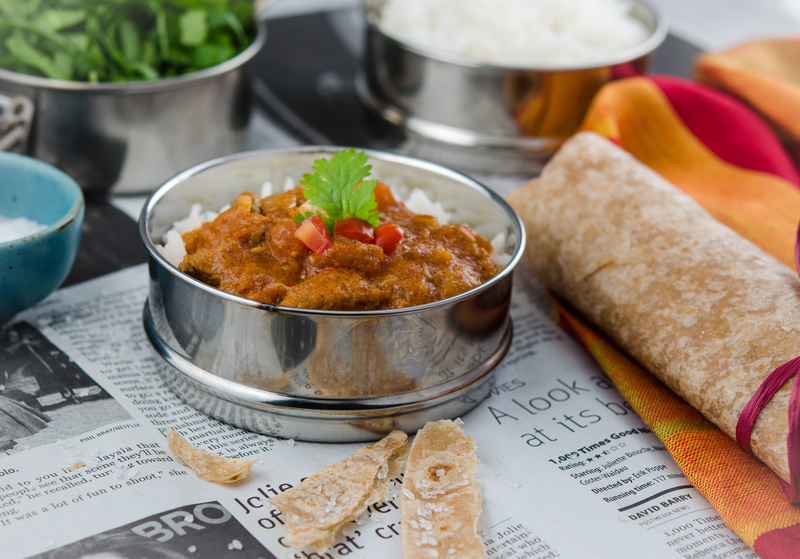 I am definitely trying this – always love a new curry recipe! Thank you so much for sharing, and happy FF anniversary! Indian cuisine is one of my favorites too. The flavors are so bold and intense. Thanks for sharing; these pictures are gorgeous. Ahh, this looks so good, Julianna! One of my favorite dishes!